Because everyone develops cataracts as they get older or due to conditions such as diabetes, cataract surgery is the most commonly performed surgery in the world. Like any type of surgery, complications can occur during cataract surgery but are relatively infrequent. It is also useful to know what sort of vision you can expect. What vision can you expect? Nationally, 95% of patients having cataract surgery who had otherwise normal and healthy eyes had driving standard or better vision without glasses after surgery. In eyes with other eye conditions 79.9% reached the driving standard or better vision. The outcomes of surgery are thus excellent. These results were based on NHS cases using standard monofocal lenses. Operations were performed by surgeons of all grades from trainee to consultant. Results with toric lenses, multifocal lenses, or lenses together with laser surgery performed by experienced consultant surgeons are likely to be even better in the terms of the final vision achieved. The risk of a complication during cataract surgery such as a tear of the lens capsule or loss of vitreous jelly was 1.9% nationally. At OCL, our cataract surgery complication rate is just 0.37% – well below the national average. 1/1100 risk of a severe complication such as infection or internal bleeding that could permanently reduce vision. 1/100 risk of needing a second operation on the same eye to reposition or replace the lens. 1/10 chance of a membrane growing over the lens needing a simple laser procedure performed sometime after surgery (up to several years later). Risk factors for complications are: increasing age, male gender, presence of glaucoma, diabetic retinopathy, brunescent/white cataract, no fundal view/vitreous opacities, pseudo-exfoliation/phacodonesis, reducing pupil size, eye ball length of 26.0 mm or greater, the use of the alpha-blocker doxazosin, inability to lie flat and trainee surgeons performing operations. Cataract surgery is safe, has low complication rates and excellent visual outcomes. However, for any sort of elective surgery you need to minimise risk, and have the peace of mind of knowing that if a complication does happen you’ll be in the best hands to manage the complication and have 24 hour access to care. Wherever you have your surgery, choose a consultant eye surgeon with experience of cataract surgery and other front of the eye surgeries. Check that they are fellows of the Royal College of Ophthalmologists and Royal College of Surgeons, and members of organisations such as the European Society of Cataract and Refractive Surgeons. Ask them what their complication rates are and what measures are in place should you be unlucky enough to have a complication. 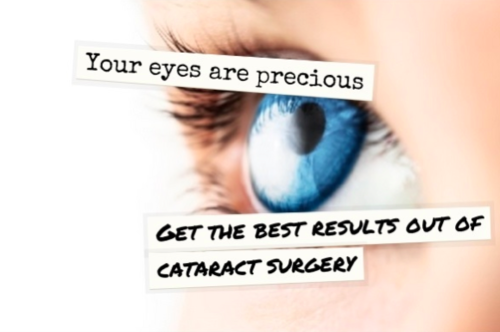 Our surgeons are here to guide you through the available choices and risks of cataract surgery during your consultation. Speak to us today on 0203 369 2020 or get in touch using our contact form.